The sixth house is known for attention to detail, but Neptune has other thoughts on the subject. 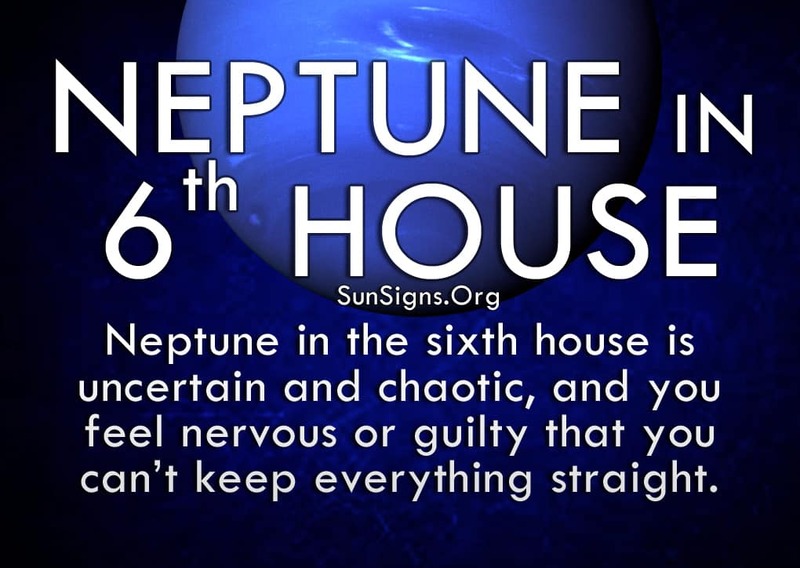 Neptune in 6th house is uncertain and chaotic, and you feel nervous or guilty that you can’t keep everything straight. You struggle with organization and want more out of life than routine. In astrology, Neptune symbolizes helpfulness, psychic strengths and idealism. In the sixth house, you try to be useful by helping others with difficult projects or events. This works well until your scatterbrained tendencies kick in and you lose track of what you’re doing. You want so much to be a part of the crowd that you try to take on more responsibility, but the outcome doesn’t always work out in your favor. Try to zone in on the task at hand and write things down in one place. That way you’ll always have something to reference when your mind begins to wander. You often start with grandiose ideas, but when it comes down to the smaller details you begin to lose focus. With Neptune in the 6th house in your natal chart, let your imagination run wild for a while and amp up your confidence to do something big or important. Your creativity is infectious and others will want to get on-board to help make your vision a reality. Your desire to add something new or different is a good instinct, you just have to know when it is appropriate. Don’t worry, that kind of knowledge will come from experience. Just remember that you have a strong sense of intuition, and you can use it to determine the projects or plans best suited to your strengths. Take charge of your memory and attitude and play around with different coping mechanisms. This will help boost your self-esteem and you won’t be afraid to offer your help or guidance. People with Neptune in the sixth house, should be careful not to place too much pressure on other people to pick up the slack, for that can lead to resentment. While you have difficulty finishing certain tasks, it’s not always up to someone else to finish it for you. Your close social circle is very understanding, but they shouldn’t encourage you either. It’s up to you to figure out the best way to handle your affairs. Make sure you’re not passing off work to other colleagues or family members because you’re afraid it won’t get done otherwise. Because of this potential struggle you may also have problems with your health, whether real or imagined. You are constantly stressed out and that can lead to vague symptoms such as insomnia, lethargy, or heart palpitations. You have to learn different ways to manage your stress, whether yoga exercises, meditation healing, or letting off some steam by going out dancing. Neptune in 6th house astrology predicts hat if you don’t address the situation early then it will only get worse. And if that happens you might think the situation is more dire than it actually is. You have to recognize what your body is telling you without letting your imagination run rampant with thoughts of illness that aren’t real. And believe the doctors when they come up with a diagnosis, for it may not be as bad as you think it is. Trust their years of schooling and experience over your potential paranoia. Work on handling your daily responsibilities in a more efficient manner, and you will lead a much healthier life overall.